The world of computers is pretty exciting: sitting at a desk, pushing down keys, moving a piece of plastic and pressing a plastic pad while blue light from your monitor illuminates your desk. Who wouldn’t want to do that all day? Some individuals can’t use a mouse and a keyboard because of mental or physical impairments. But there’s a piece of assistive technology that was designed for people with these impairments to an alternate way to use a computer! It’s called the orbiTouch. The orbiTouch is a keyboard that does not rely on clicking small keys packed together on a QWERTY keyboard, but rather a combination of hand gestures to input letters and commands. 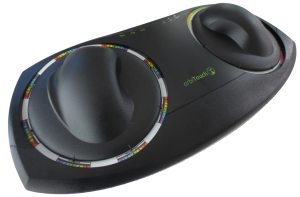 This keyboard removes the pain induced by using the fingers and wrists to type, and reduces the impact of typing related strains and injuries. 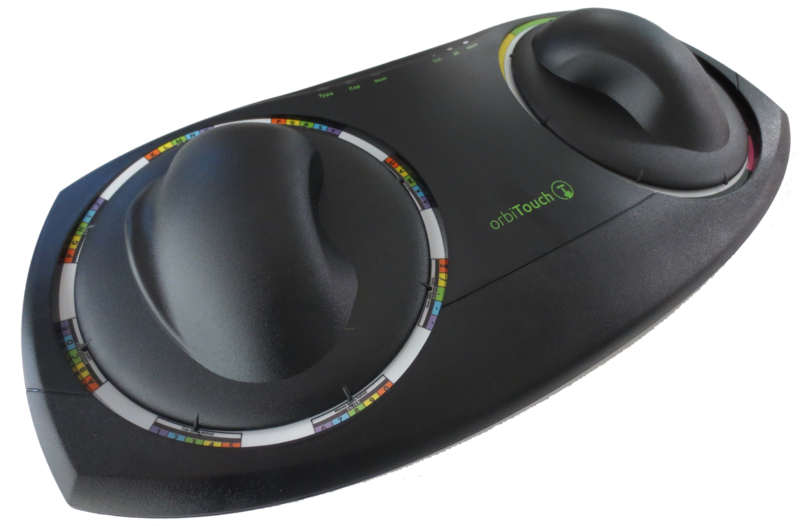 The orbiTouch also empowers people to use a computer in a more accommodating manner. By replacing the act of typing using fine-motor skills with typing using a wider range of arm movements, the keyboard allows individuals with fine motor impairments and/or hand related disabilities to communicate. Instead of having its own individual keys, letter and characters are grouped in distinct sets around the edge of the left dome. Each letter or command in a set has a different color. The right dome has different colors around the edge. You slide one dome to select a grouping and the other dome to select a color. The keyboard will then input the letter that matches the color and grouping to the computer. To input the next character, you only have to re-center one of the two domes. This allows the user to input multiple letters while only changing one dome position. If, for example, you wanted to spell the word “yo-yo”, you would select the grouping with “Y” in it, and the color purple. The next letter is “O”, which is also in purple, so only the grouping/left dome needs to be re-centered. While holding the right dome that has the color purple selected, slide the left dome to the “O” grouping to insert the letter “O”. To finish the word, you must change both dome positions to input a dash, in blue, and repeat the previous combinations. By grouping the letters and numbers in a manner that is logical and easy to distinguish, people with autism/autistic people have an easier time learning and typing with the orbiTouch than on a typical keyboard. Studies had shown that the extent of the learning curve was dependent on the amount of time spent practicing with the keyboard. 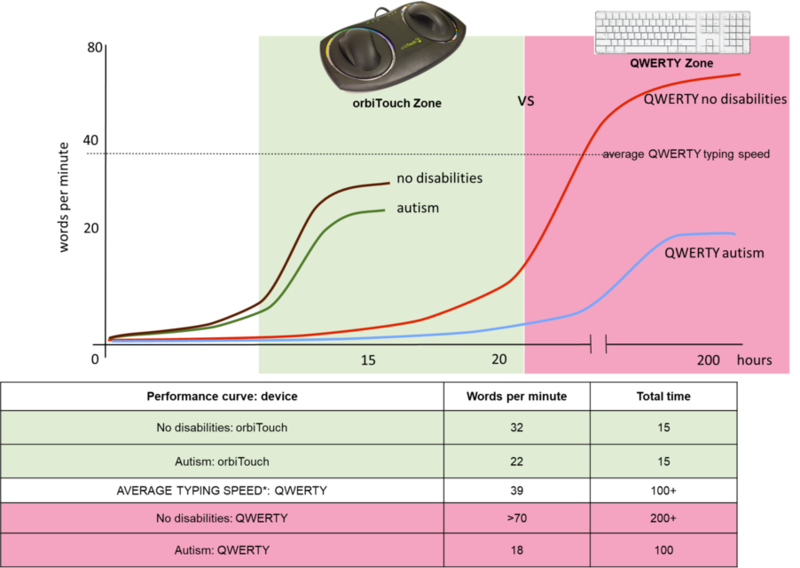 In this study, the learning curve was minimal for users with autism/autistic users, who were able to type faster on the orbiTouch keyboard in 15 hours than on a QWERTY keyboard in 200 hours. This entry was posted in Tech Blog and tagged Accessibility, Assistive Tech News, Computer, Computer Usage, Domes, Input, Keyboard, technology.